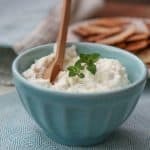 I’m all about “toppers.” In fact I’m working on a new category called, “Gourmet Done Skinny Jazz Toppers, ” and this Healthy Creamy Parmesan Herb Dressing and Dip recipe will be definitely in that category. It’s so versatile! I use it on everything-as a dip with Lavash crackers (see recipe for crackers in the note section), in tortilla wraps with chicken, lettuce, and tomatoes, and as a topping for my turkey sliders and just recently I tried it as a base for a personal pan pizza. (I’ll be doing a recipe with that one for sure!) 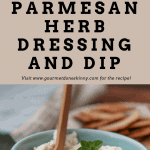 This Creamy Parmesan Herb Dressing and Dip would also be good as a topper on steak and obviously it makes a fabulous salad dressing as well. This Healthy Creamy Parmesan Herb Dressing and Dip is so versatile. It’s great with crackers, spread over fish or chicken, on turkey burgers and makes a great salad dressing. Because it’s made with non-fat Greek yogurt it’s low in calories and Smart Points. It also stores well in the refrigerator (you can keep it up to 2 weeks as long as the yogurt date is fine). In a small non-stick skillet, add 2 T. olive oil and heat over medium heat. Add minced garlic and toast for just a bit, just until slightly golden, do not let garlic burn. Allow to cool while chopping herbs. Wash herbs and finely chop. Add to cooling garlic mixture. 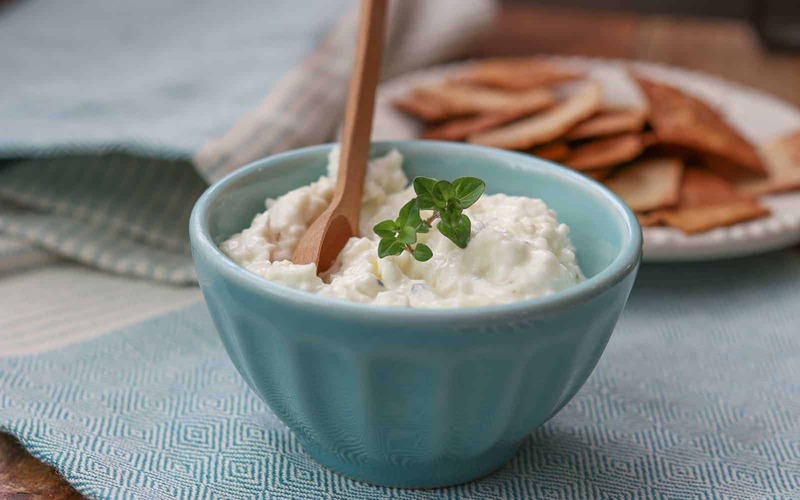 In a medium sized bowl, combine yogurt, herb and oil mixture, lemon juice, mayonnaise and cheese. You can use it immediately but I like it better after it sits a day. It will keep in the refrigerator for over a week as long as the yogurt date is still good. If you want this to be more of a dressing, add a few drops of milk. To make the Lavash Crackers: Place 1 Joseph’s Flax Oat Bran and Whole Wheat Lavash Bread on a cookie sheet lined with parchment paper. Spray with oil. Sprinkle kosher salt over all. 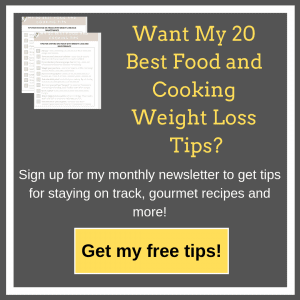 Sprinkle herbs such as dried oregano, granulated garlic, dried onions etc over all. With a pizza cutter, cut into squares. Bake at 375° for about 5 minutes. Do not let it burn. Allow to cool on cookie sheet before removing. This cooling process helps, “crisp” them up. Only 2 Smart Points for the entire batch of crackers! No Replies to "Healthy Creamy Parmesan Herb Dressing and Dip"